2-Fluoroadenine (2FA) is a therapeutic agent, which is suggested for application in cancer radiotherapy. The molecular mechanism of DNA radiation damage can be ascribed to a significant extent to the action of low-energy (<20 eV) electrons (LEEs), which damage DNA by dissociative electron attachment. LEE induced reactions in 2FA are characterized both isolated in the gas phase and in the condensed phase when it is incorporated into DNA. 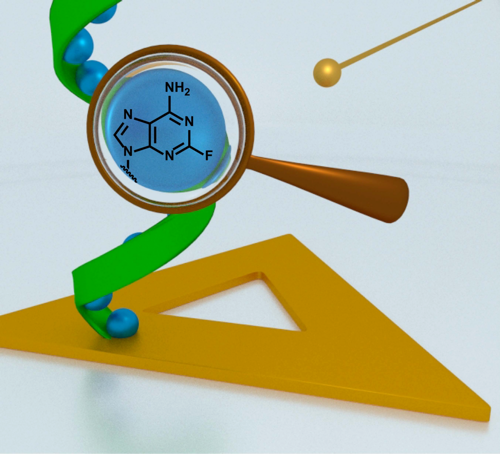 Information about negative ion resonances and anion-mediated fragmentation reactions is combined with an absolute quantification of DNA strand breaks in 2FA-containing oligonucleotides upon irradiation with LEEs. The incorporation of 2FA into DNA results in an enhanced strand breakage. The strandbreak cross sections are clearly energy dependent, whereas the strand-break enhancements by 2FA at 5.5, 10, and 15 eV are very similar. Thus, 2FA can be considered an effective radiosensitizer operative at a wide range of electron energies.